A wedding with a baby, are we mad? 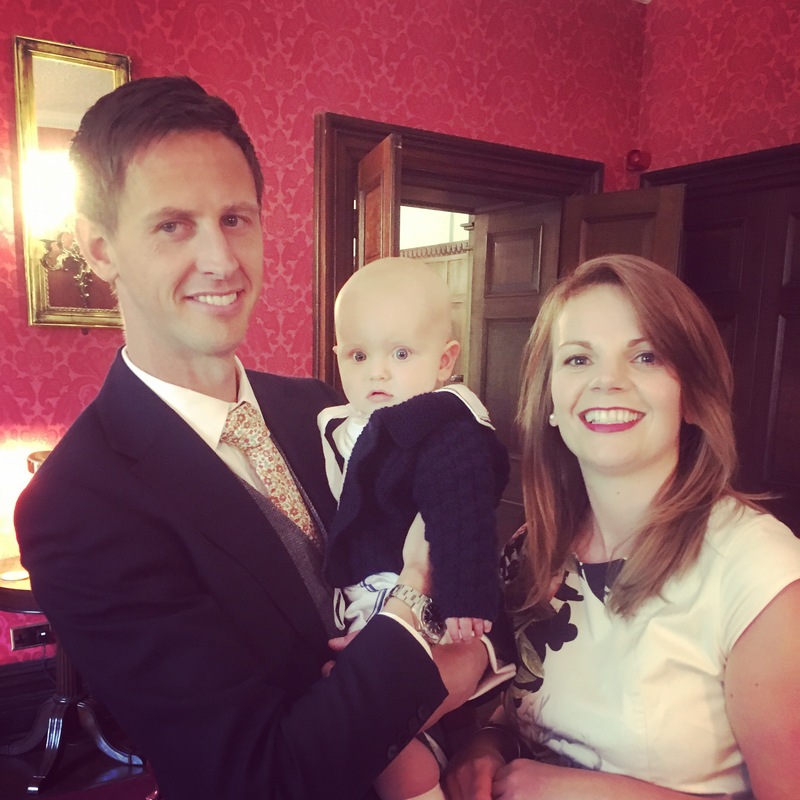 A week or so back we had our first experience of taking a baby to a wedding. Relaxing it was not, but it was so lovely to have him there with us and for him to be a part of the day. It was the son of our close family friends who live in Northumberland so we all travelled up there for the weekend, grumps, grandma and his uncle and auntie. We shared a cottage in the grounds of the venue which was great, it made life so much easier as we could just nip back to change him if needs be. Dare I say it but the little man’s sleep has finally started to improve and he’s dropped a night feed. This just started to happen before we went up north so we were a bit worried about what it would do to his routine. He decided he needed a 10pm feed again while away but to be honest I think this just because he was in a different environment and hearing different noises that woke him up. Something we’ve found to be a brilliant buy was a travel cot bed mattress topper from kiddicare. It was £20 and makes the travel cot so much softer and it’s light to travel with so doesn’t take up much room. Another tip we discovered was using the sling at the church so when he got a little grizzly we could stand and bounce him around at the back quite easily. Which we had to do, for pretty much the whole service. But we kept him from having a complete meltdown, I’m sure no one else would of noticed but I would of hated to think we’d been a distraction or caused any noise during something so important. The bride and groom were so sweet, leaving a little bag of goodies for him at his place at the table, a hand puppet, puzzle and bubbles which kept him amused for most of the way through the speeches. It was a lovely day, and another weekend spent making memories. Life got a whole lot messier a month or so back when we made the decision to start weaning. I held off for as long as I felt I could (another case of feeling anxious about bloody recommended guidelines). We started off slowly at about five months with a small portion of baby rice around tea time, yes in the hope that it may of helped him sleep- it didn’t (of course) but he quickly showed signs of being ready to move on. We spent a couple of weeks trying different purees of single veg, constantly amusing ourselves with the over exaggerated faces he’d pull when trying a new flavour. 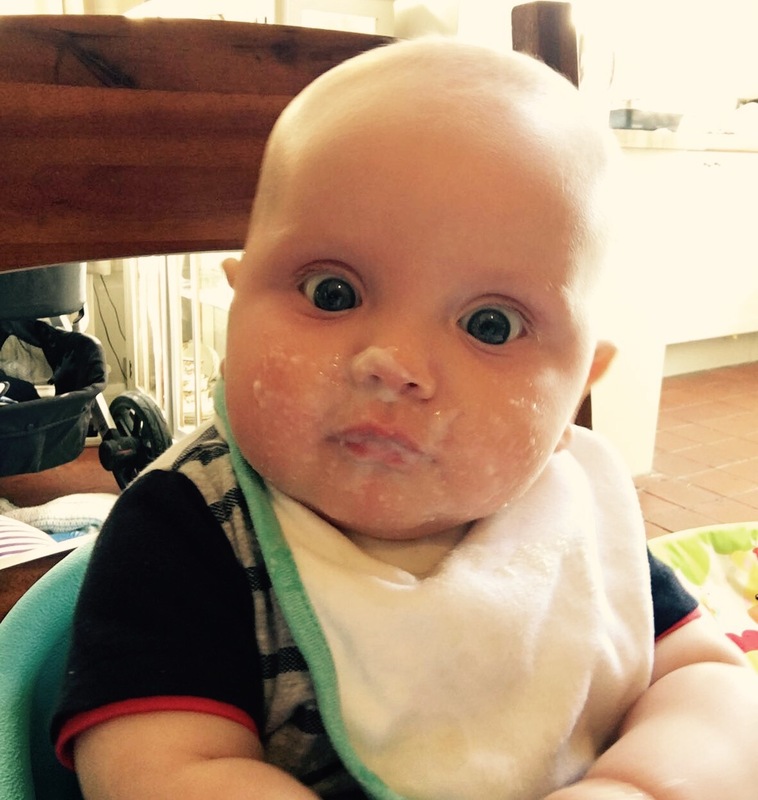 We then started to move onto combinations, quite quickly he showed he preferred purees thicker and a little lumpier and by the time we got to six months he was having breakfast, lunch and tea. He’s been having a bit of finger food to play around with too. 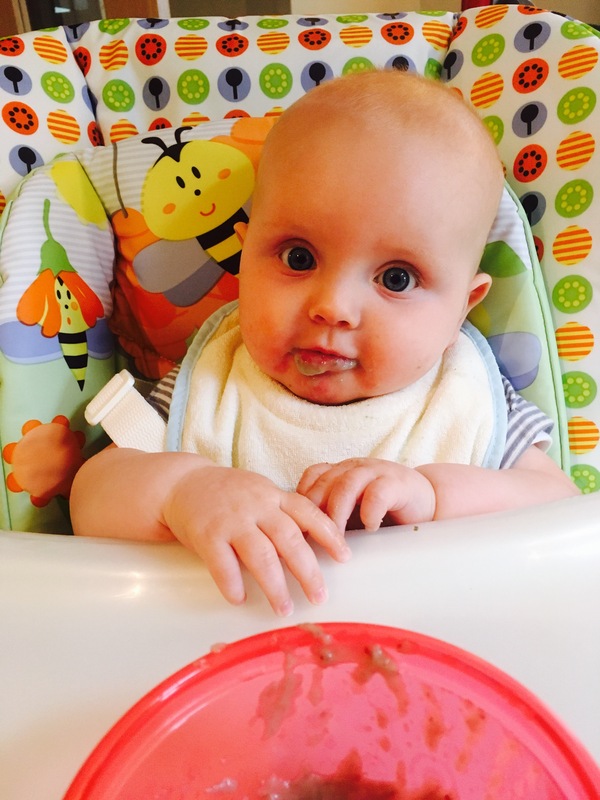 He absolutely loves food, which has been a relief after months of bottle refusal and terrible sleeping patterns and this has been such a fun stage. I’ve got a good baby recipe book (Ella’s kitchen first foods) and my friend gave me some Annabel Karmel books which have been useful but I’ve been making things up too. One recipe I came up with is a favourite – butternut squash, rice, cottage cheese and pear, so a baby take on squash risotto with a bit of sweetness. Salmon, broccoli and new potatoes which I mixed with some crème fraîche was also a big hit this week. I’ve found you really don’t need any fancy equipment for this stage, I’ve just used a colander over a saucepan to steam things and my hand held blender. We moved on to just using a fork to mash things up fairly quickly. Some kit that I have bought which I have found useful though are these weaning trays by OXO. They use the ice cube size portions some of the Ella’s Kitchen recipes recommend and I’ve found them great for batch cooking. Once they are frozen you just pop them out, bag them up and stick them back in. Then you just take out your required portion when needed. Perfect. I love making things as gifts for special occasions. 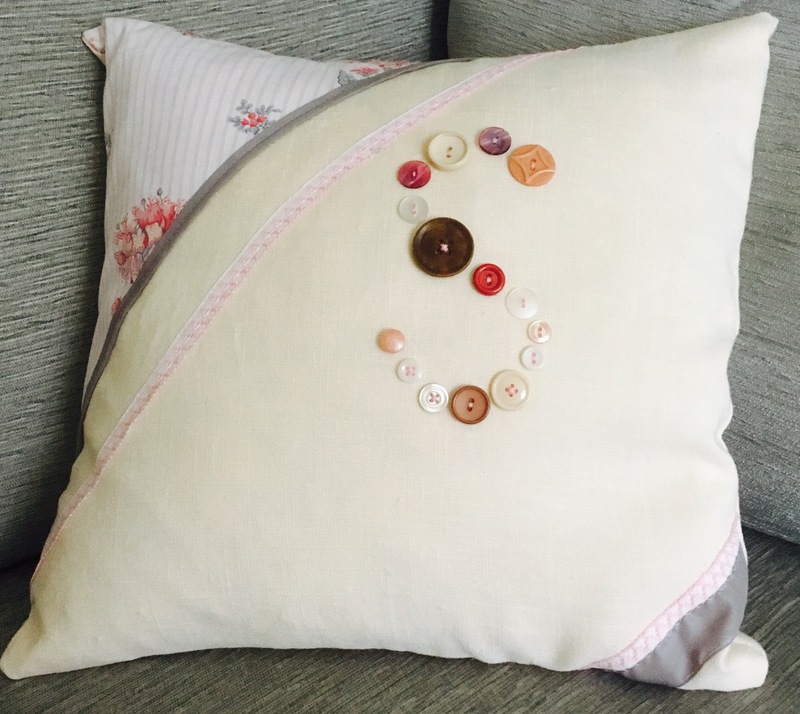 A few years ago I made my friends little girl a cushion for her christening and last month I had the perfect motivation to get back behind my sewing machine. I’ve made two lovely friends since having Joshua. Mr B and I just did the NHS antenatal class, we decided against nct in the end, so it was only a day session but out of a big mix of people I’ve met two fab ladies who also both had baby boys. 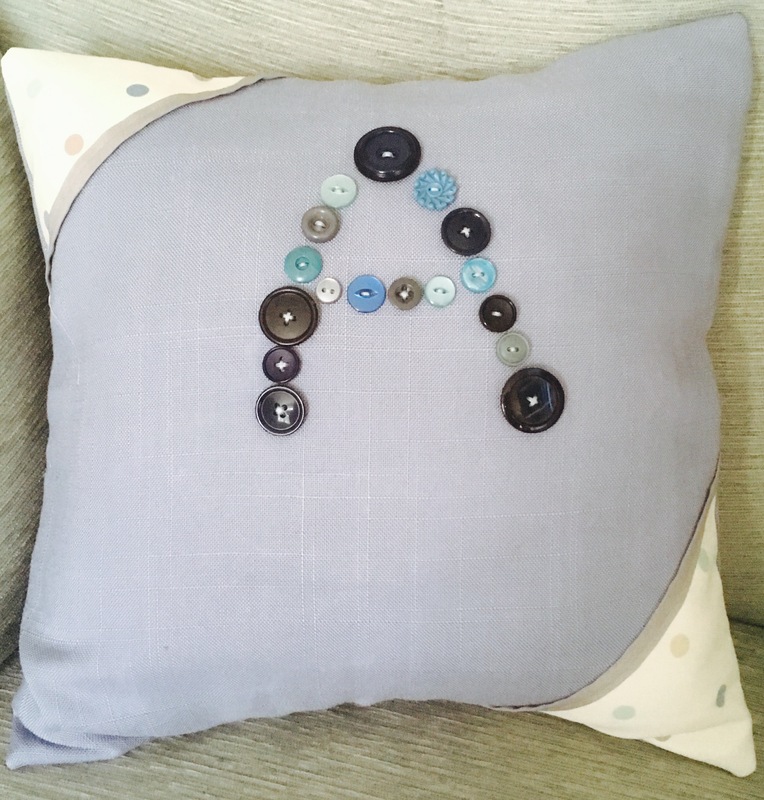 One of them had a naming day and to mark the occasion I decided to make him a cushion which he’ll be able to keep as he grows up. 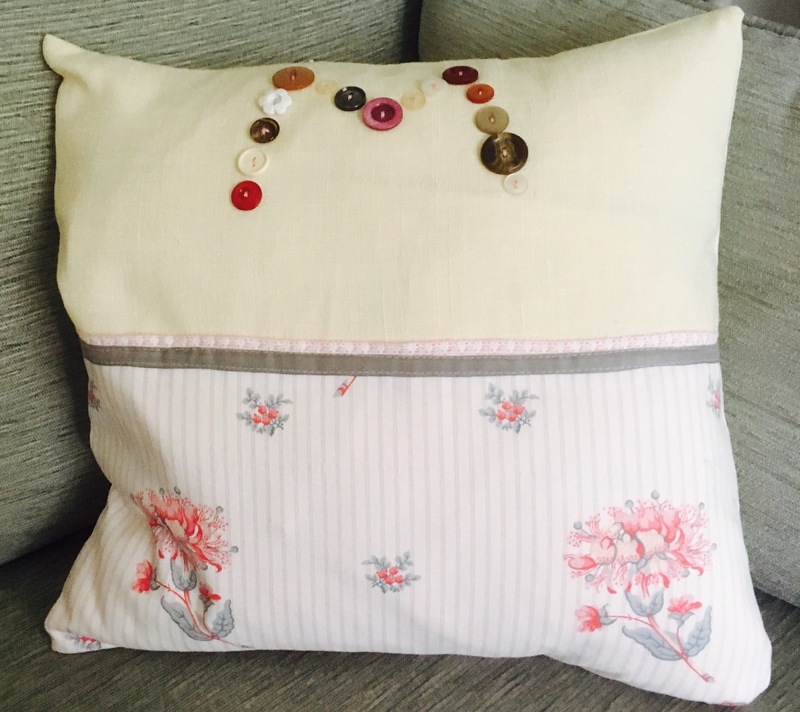 Making them for boys always seems harder as thereare so many pretty girlie fabrics (and my studio is full of them!) but I opted for blue linen with a spot fabric and then sewed vintage buttons on in his initial. A week later it was our good friends twins first birthday, again I wanted to get them something that they could keep as they got older. They have such different personalities so I made two different designs but used the same vintage fabric so they work together if they share a room as they get older. I’m sure none of them at this stage are impressed with a cushion but hopefully they’ll appreciate them in years to come. I seem to have gone through another phase of buying lots of cookery books (getting a chance to read them all properly is another matter!). I’ve been justifying it by stopping buying food magazines. Instead I download and read them for free on the IPad using Cambridgeshire Libraries emagazine service, which is brilliant. I think this is a service that lots of local authorities run – it’s definitely worth finding out about. I love Mary Berry. When I grow up I want to be just like her. This book accompanied her most recent TV series, it’s full of really simple crowd pleasing recipes. I love it, so much so I had to buy another copy to give to my bestie for her birthday (we’re definitely getting old). I’ve made lots from the baking section, which is really bad as none of my clothes fit me as it is (I’m not sure how much longer I can use the ‘but I’m breastfeeding’ excuse and get away with it). It’s well laid out with simple easy to follow recipes that cater for a range of occasions. Definitely another time proof classic. I put off buying this book for as long as possible as I’m always skeptical when something’s so talked about. We’re now obsessed by it and for the last three weeks or so have been cooking most of our mid week meals from it. The guy’s a little bit too enthusiastic for my liking on his social media sites but he’s got to be applauded for what he’s doing and the amount of people he’s inspiring to make lifestyle changes. His workouts are really easy to follow too. I can honestly say of all the recipes we’ve tried (and it’s a lot of them) we have yet to come across something we don’t like. The hubby quite enjoys cooking from it too – bonus. So far our favourites are curry fried rice in a hurry, the McLeanie Burger and the chicken pie. All yummy. I’ve also had delivered Sirocco by Sabrina Ghayour (I adore her first book), I’m yet to cook from it but I’ll report back as soon as I do, oh and a new Paul Hollywood book. As I write this it’s 3.45am and I’ve not yet gone to bed so apologies for any mistakes. The little man had his third lot of jabs today, well yesterday. I was already dreading it as after the first lot he had a raging fever bought on from the Meningitis B vaccine and we sat up all night with him whilst he cried in discomfort and feeling like a hot water bottle. After the first one his temperature started to rise 6-7 hours afterwards, but after three doses of calpol it started to come down. Tonight’s been a different story, he had the jabs at 9.30am (this time I took my calpol with me to give to him as soon as the nurse had finished) but he was absolutely fine until about 5pm, it just climbed and climbed after that. Four doses of calpol later it was still up, spiking at 39.4. A call to 111 and a mad 1am dash to Tesco later we’ve now got some baby nurofen down him (I wish I had known I may need that before hand!) and touch wood it seems to be coming down. We managed to get him into his cot at about 2am, but I’m far too worried to leave his side at the moment. I’m desperately trying not to be an overly anxious first time mum but it’s so hard. Everything is such a steep learning curve and you feel such an indescribable sense of responsibility for this tiny little person that when something like this happens it’s hard not to panic. I’m so thankful though that he’s received the immunisation, especially with all the media attention around it at the moment, luckily we were better prepared for his reaction this time round. Although I think he seems to suffer with it more than some have it seems? No more jabs until he is a year old though. I sense a lot of caffeine will be required tomorrow.